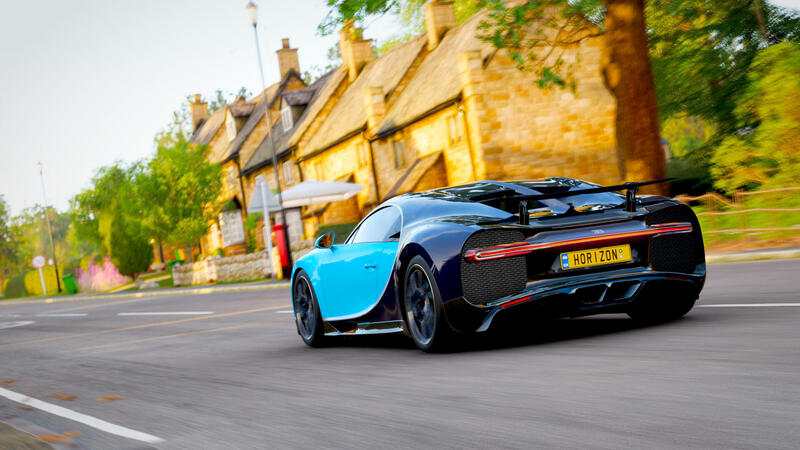 Horizon Stories deliver all-new story-driven gameplay events within Forza Horizon 4’s world of beautiful, historic Britain – and the first of these will see you acting as a stunt driver for an upcoming film, driving the spectacular 2018 Bugatti Chiron with a jet on your trail. Not only is this the fastest production car in the world, but it’s ready to take on a Danger Sign and leap across some British countryside in a high-impact action getaway scene. Each of the different story threads within Horizon Stories are divided into chapters, and you can earn stars from these events to unlock new levels. Think of these as the evolution to the Bucket List challenge system of past Forza Horizon titles. It’s the same fun and exciting challenges, but now expanded out into a variety of different chapters complimented by cinematics that feature various new characters with story-driven action. There are many different types of Horizon Stories in Forza Horizon 4, and some of them are attached to businesses. Should you purchase a taxi firm, you’ll be able to take on taxing missions as you race fares to their requested destinations. Another comes in the form of ‘World’s Fastest Supercars,’ which is a supercar rental business located in Edinburgh. Here, you’ll be driving supercars for fun and making credits every time you log into the game as exotic cars are temporarily rented out to aspiring motorists. In the video above, you can check out our attempt at being a stuntman in the 2018 Bugatti Chiron in the first of many Horizon Stories chapters. The video was captured in 4K resolution on the Xbox One X at a recent Forza Horizon 4 preview event at the McLaren Technology Centre in Woking, Surrey, where we had more than two hours of hands-on time with the full game. Be sure to check out our in-depth preview for our initial impressions of Forza Horizon 4, which is currently shaping up to be Playground’s biggest and best Forza game yet. You can also hit up our earlier gameplay videos featuring the stunning introduction to Forza Horizon 4.